It takes more than wind to find an ideal kite surfing spot. Granted, that’s a big part of it, but there are other factors to consider, like how flat, choppy, or wavy the water is, the weather (other than the wind conditions, of course), and location’s overall vibe. Sure, if you have your own kite, board, and harness, you can go kite surfing at a place close and convenient to you — may it be a lake or your local beach — but if you’re looking for that unforgettable experience all you need is a will, a way, and some wind. 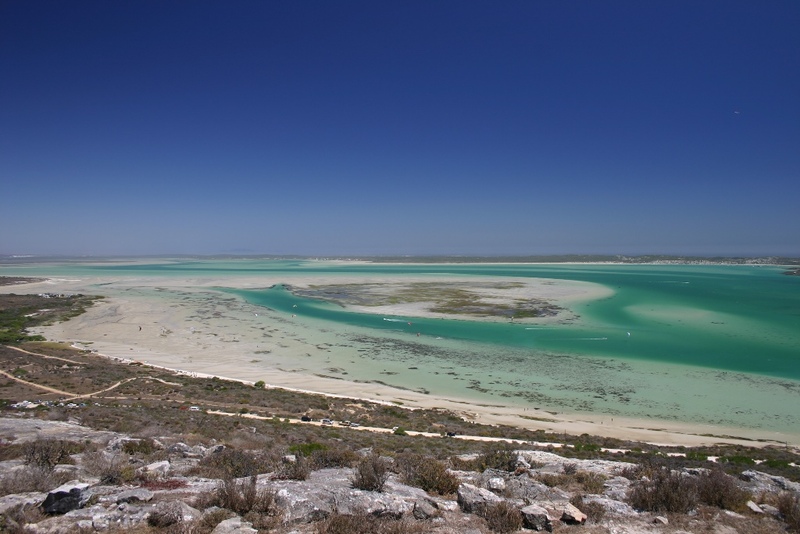 So if you want those perfect wind conditions in shallow flat crystal clear water, drive through the West Coast national park and discover the beauty of Sharkbay. Don’t be put off by the name, although it does spell doom, beautiful Sharkbay in Langebaan got its name from its numerous and harmless sand-sharks, not the greater and whiter variety, never the less It’s amazing and my personal best spot and I want to share with all of you. Majestic Sharkbay, although it can get crowded you can bolt further up wind to find your own space. South Easterly Side onshore 15 – 25 knots consistent winds throughout summer / mid October – mid April. Warm water 18 deg plus. Flat-water ideal for the beginner kitesurfer. Shallow water at which you can stand for up to 500 meters distance before you reach the channel. No sharks see urchins, rocks or other obstacles but white soft sand with the odd sand shark on which you might stand. 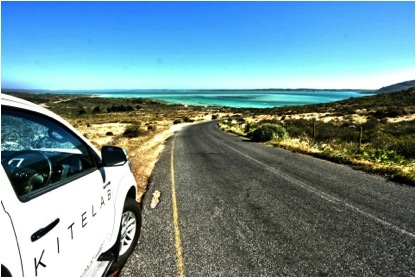 Top picture: Driving through Langebaan and down black mamba hill “ nick name “ you will find a right turn into a dirt road at the bottom of the hill. Although it says private property no entry bla bla… silly developer… Keep going on this dirt road for another 200 -300 meters at which you will find a little pathway down to kite heaven. 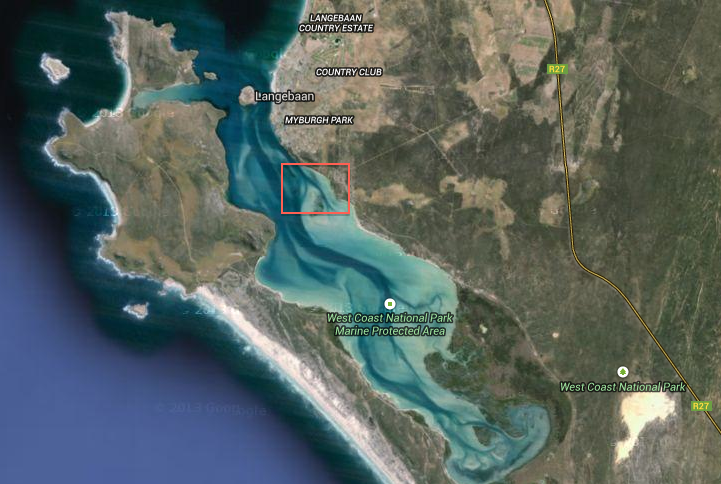 Note: Even though Sharkbay & Langebaan are next to each other, the conditions can differ with 5 – 10 knots more wind at main beach. Kitelab`s advices don’t wait for wind all day on one of the spot. It might blow on the other side of the lagoon! Check both for the best conditions. 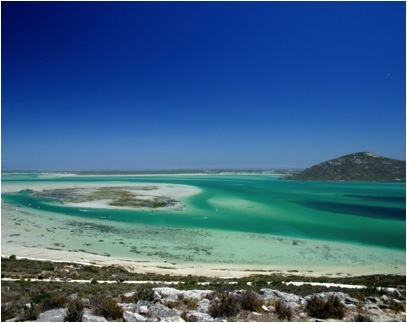 Top Picture : Langebaan West-coast National Park Lagoon, red selection Sharkbay.